Make Your Own Hydroponic System With 2 Liter Soda Bottles #NatureAndTechnology « Adafruit Industries – Makers, hackers, artists, designers and engineers! There are 24 2L soda bottles that each hold an individual plant. Nutrient is pumped from the bottom reservoir to the top through 1/2″ tubing and reduced into 1/4″ tubing going into each of the top eight 2L soda bottles and is gravity drip-fed downward through remaining 16 bottles and back into the bottom nutrient reservoir..
We built this system to help people understand certain aspects of sustainability as well as providing fresh ingredients for our resident chefs and lunch for everyone else around. We incorporate this in our education curriculum at SoHa SMART. We look forward to a future of being able to grow our own food and make our own medicine as well as giving Mother Earth a break and taking responsibility . This is a simple design and very nice to look at and listen to. 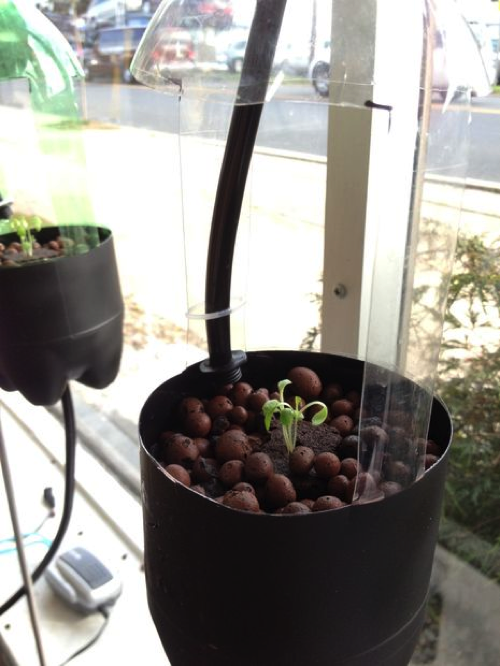 In another Instructable we will add automatization and grow lighting via LED. *Please read entire Instructable before you begin to understand the sequence of steps and adjust for your needs.